Whenever I go into the theatre to watch a sequel I brace myself and prepare for the worst. You kind of have to right? I mean, if the first movie was good, your expectations are going to be too high for the second one. If the first one sucked, the second one doesn't get made or no one goes to see it. When The Hunger Games hit the theaters, there was little to no chance that the second movie of the trilogy wasn't going to be made. The books were blockbusters in their own rights and the movies would be as well. With the talent behind the movies, there was little stopping it. And nothing did. The Hunger Games went big and knocked it out of the park. Then came Catching Fire, the second film in the trilogy. Would it live up to expectations? I have read the whole series and I can tell you right now, I had my reservations. My favorite character in the whole trilogy was Finnick. He wasn't introduced until the second book, thus his character was not revealed until the second movie. This could make or break the whole thing for me. Fail with Finnick, and fail with the entire series. Luckily for the producers, they did not fail with the Finnick casting. I can't believe how bang on they were with their casting of Sam Claflin as Finnick Odair. It was perfect. From the photos I wasn't sold, but once he hit the screen - full relaxation. They got it right. Catching Fire was not like the Hunger Games. The pace was faster and there was more on the line. This was the same for the film. Katniss and Peeta head off on their tour of the Districts after winning the Hunger Games. They become aware of the rebellion spurning within the Districts and see some of it first hand while stopping at each of the Districts. I would be lying if I told you I didn't cry when they stopped in District 11 and Katniss talked about Rue. Pretty much, f-ck everyone that didn't think that was the saddest on screen moment of 2013. Everyone of District 11 was crying and grateful and then they bust a cap in the head of the old man who salutes Katniss and whistles a song (Holy hell, I would not survive in a post-apocalyptic era - I would be shot in five seconds). After their tour, President Snow is not thrilled with their performance and wants to do away with them. A plan is devised to send the old victors back into the Hunger Games for the 75th anniversary of the games. Dun dun dun. Katniss, being the only female victor from 12 is chosen and Peeta volunteers for Hamish who has his name drawn. Oh-EM-JEE, it's the Hunger Games all over again. Except this time there is Finnick. The hotness factor of this movie is exponentially higher than the first. So Katniss and Peeta head back to the Capital...still playing the game of 'star crossed lovers' (I get it, but it doesn't mean i can't think it is lame. as. fack.) and they meet the other 22 victors who will be heading back into the area to play in the 75th games. A bunch of old people and Finnick. Sorry, I wasn't paying attention to anyone else, you'll have to forgive my lack of description. It does not end as you think it might and there are all sorts of twists and turns along the way. One of the turns being Mags' ending...that brought on the waterworks. I don't want to ruin it, but what I will tell you is, the ending isn't really an ending and you will leave the theatre enraged that Mockingjay hasn't been released yet. I felt that way when I finished the book, but then I picked up my Kindle and, BOOM, five seconds later I was reading the last book. Sorry, you'll have to wait at least a year. So what about the actors? Did they deliver? 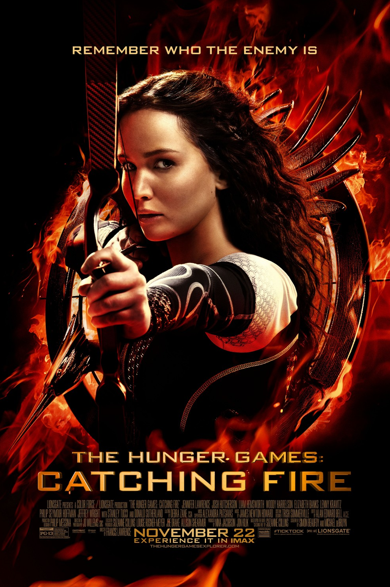 Jennifer Lawrence was amazing as Katniss. You really wouldn't think anything different. The girl won an Oscar last year for goodness sakes, if she screwed this up, it truly would be a travesty. Josh Hutcherson was way less annoying in this movie than the last, but that is all in character. Peeta really does grow on you...in an, 'OK fine you can hang out with us as long as you don't talk and do whatever we want', kind of way. He still is not fully un-irritating. I know Liam Hemsworth is a big name associated with these films, but his face time is about 15 minutes combined in the two movies. I always felt like Gale had a much bigger role in the books, but maybe that was because I am (and always will be) on Team Gale. He plays the part well, even though there's not much he can do. Jenna Malone as Johanna Mason was fantastic. Johanna's character is annoying as all hell, so the casting of Malone was pretty on point. My favorite, besides Sam Calflin playing the socks off of Finnick, is Stanley Tucci as TV host, Caesar Flickerman. I hate you, but I love you at the same time...even though you have purple hair. He brings the comedic edge to an otherwise serious and disturbing story. All of that to say, yes to Catching Fire. Yes yes yes.